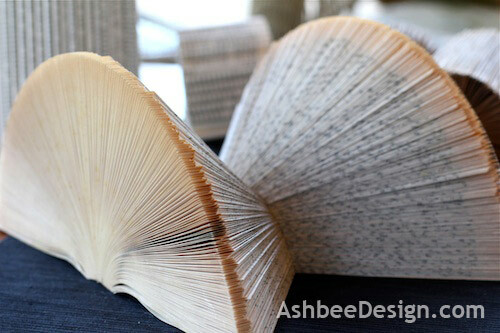 Yesterday, I started sharing some of my experiments in folded book creations. After several weeks of creating folded forms using books I decided to start altering the book shape before I started folding. I found that books came in similar sizes and shapes, and even a large book and a small book, once folded created a form that was very similar in size. 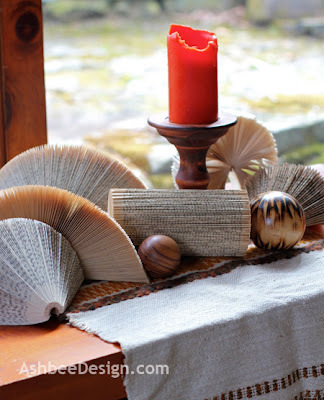 I wanted more variations for my tablescapes. 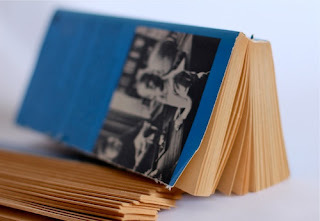 Experiment one had me slicing a book into a 1 1/2" strip on the bandsaw and folding its long skinny pages. That created the wheel like form below. It is a great shape in the arrangements but it doesn't hold as even a texture as the other shapes did. The end view shows the gaps. 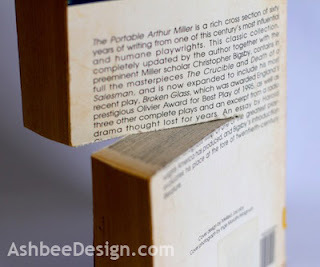 I took another paperback and sliced it the long way again using the band saw. 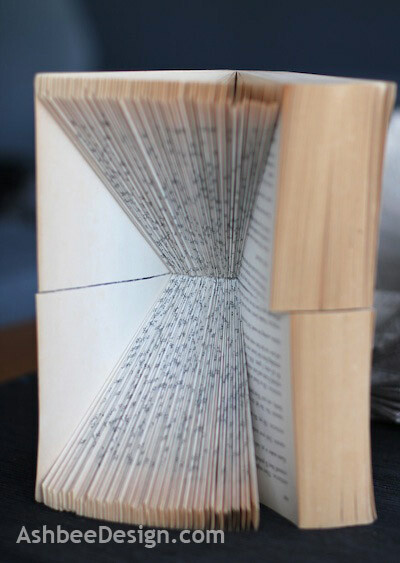 I then curled its pages in. This techniques made a long cylinder and, because of the reduced diameter, worked well in 360 degrees. Next, I sliced a split into a book right at its midpoint but I did not cut all the way to the binding. On this one I did a diagonal fold and crease from the center cut out. It created a wonderful double cone shape. This book had over 600 pages so it made a much denser form when done. The finished shape is visually dynamic and very photogenic! 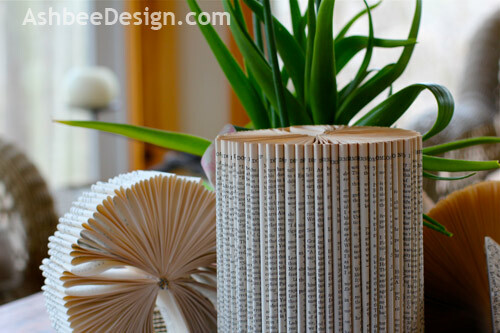 I now have a collection of folded books to place, rearrange, and interact with. Guests can play with them. They are another type of artistic building block. Consider making a set for yourself and then send pictures! I don't even know what to say about these except they are so awesome! You are one clever girl! I couldn't have come up with that in a million years! Great job! I'm VERY IMPRESSED! 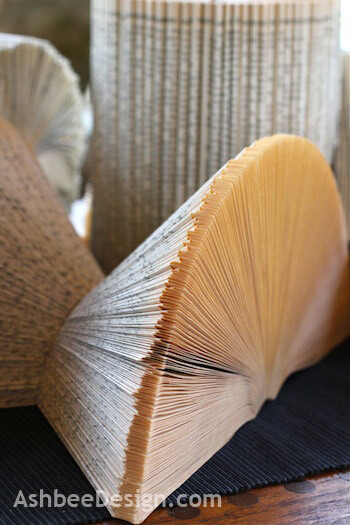 How long did it take to fold one book? It seems like it would take a while...HOWEVER...the end result is VERY NICE! 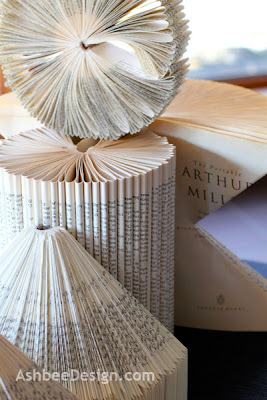 I am currently in love with book page projects, so I really like...great job! I was surprised- it didn't take as long as I thought. 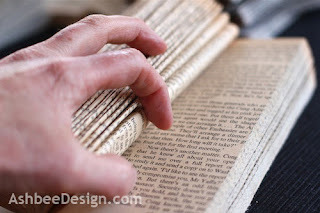 If I was curling the pages it took under 20 minutes per book. Folding and creasing took longer. I just always kept one in the kitchen and folded while waiting for the coffee to brew, or the water to boil. These are so beautiful! I would have never thought to alter them like this! You are so talented! Thanks for the comments and for your link party. I try to link up at Uncommon whenever I have a project. Thanks for the feature. This site is a regular stop for me to see and share. No band saw here but I do have a dremel tool. Wonder how that would work. I love book art and yours is delightful. Send an update if you find out that it works. And pictures! Have fun creating and thanks for stopping by.